When I first began reading this book, I really had no idea what to expect. It was a relatively easy read (on my Kindle), though some chapters read more like a history book. But that’s what the Bible is, isn’t it, a history book? Or is like any other non-fiction book written by man, just a collection of personal stories and eye witness accounts, but only with parables, stories, embellishments, thrown in? 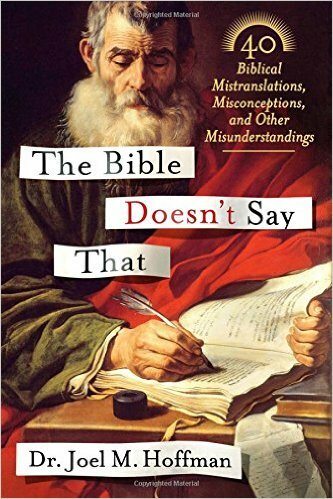 And there is the first mistake I believe modern readers of the Bible make, and which Dr. Hoffman points out in this book. While most of the Bible is factual, meaning it did happen, it is still a personal account of who did what when. And as with any personal testimonies, there will be conflicting reports among various individuals. Also, we modern English readers tend to forget that the Bible wasn’t initially written in English. In its many translations, from Hebrew to Greek, to Latin, and finally to English, there surely must have been some things changed, and some things may have been lost in the various translations. *The Ten Commandments don’t prohibit killing or coveting. While at times I did feel like I was reading a history book, I honestly found this book to be very informative. The Bible has been picked apart, used as a weapon, mistranslated and misquoted, so much so that we forget why it was written in the first place. When we take just one passage, one parable, one story, and use it for a singular purpose, we miss the whole reason these words were written down. Dr. Hoffman’s seeks to remind us that the Bible is a book, written by men a long time ago. And as with any book, should be studied in-depth, and not be quoted randomly to suit this or that purpose.